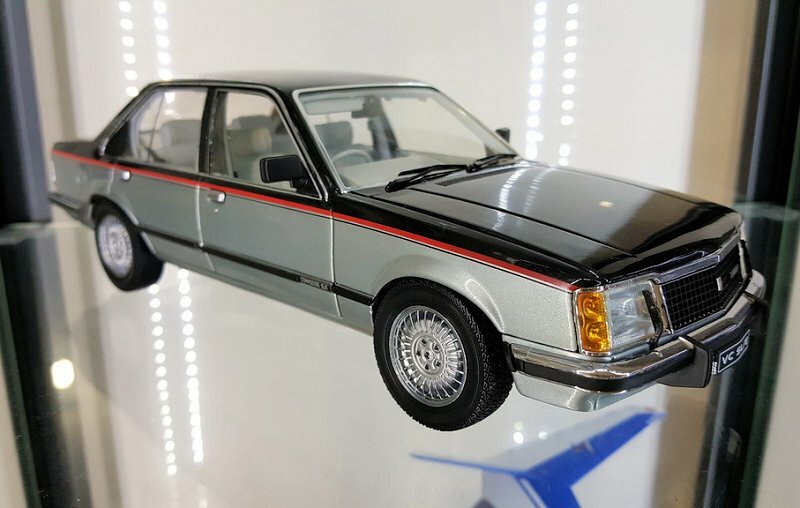 The other Biante I own is a 1980 Holden Commodore SLE but this particular model is actually a very worthy addition and its one of my favorites. 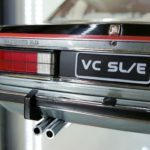 A brief history on the Holden Commodore… Released in 1978, the VB model was the replacement for the aging Torana and Kingswood / Premier model line up. 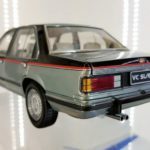 The Commodore’s design was heavily influenced by its European Opel Rekord & Vauxhall Senator cousins bringing design elements from both cars together to create the Commodore. The design similarities were only limited to exterior / interior as the Holden version used carry over engine and suspension components from the older Torana & Kingswood models as early Rekord & Senator prototypes brought to Australia for durability testing soon proved they would be unable to handle the much harsher driving conditions in Australia suffering from severe structural and drive line component failures. 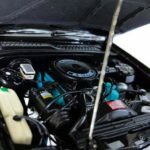 Hence Holden’s decision to use the cheaper but far more durable, tried and tested drive line components from their older model cars even though they were vastly technically inferior to the European cars. 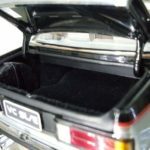 The VC model came in 1980 bringing many updates and improvements including revised engines, transmissions, suspension, standard & optional equipment. 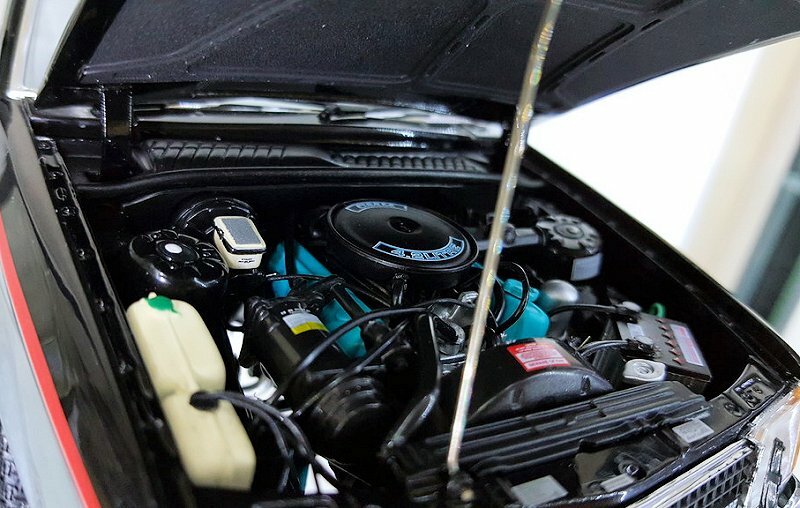 The Biante model I am reviewing is the top of the line SLE model with the smaller 4.2 liter V8 (5 liter V8 was optional) and a 3 speed automatic gearbox though I don’t recall if the 4 speed manual was available on the SLE. 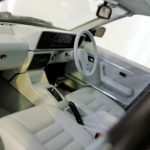 The SLE also featured electric power windows and mirrors, air conditioning, central locking, cruise control, premium sound system, 15 inch alloy wheels, four wheel disk brakes, velour trim (leather trim and an electric sunroof were optional). 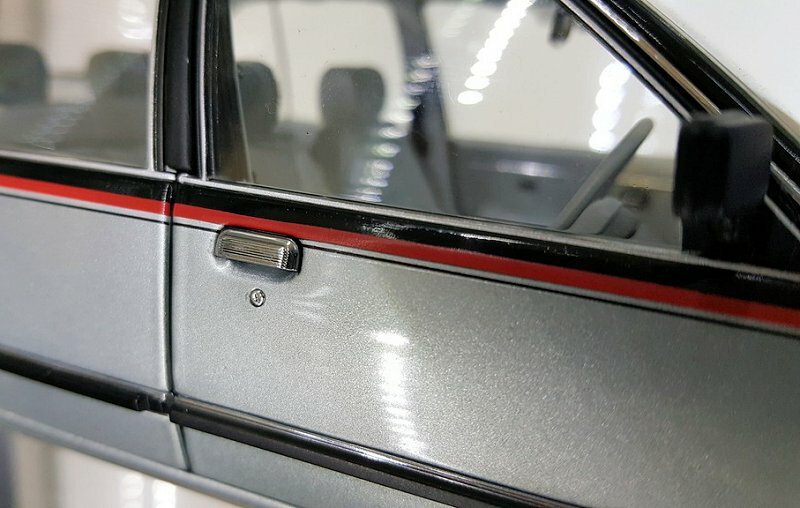 The exterior of the model is neatly finished in the two tone black & silver metallic paint with red and black pin striping. The effect is reproduced quite nicely. The paint is smooth and consistent through out with no real visible blemishes. Body proportions are good overall though I feel the model could have been a fraction wider but its still perfectly fine. 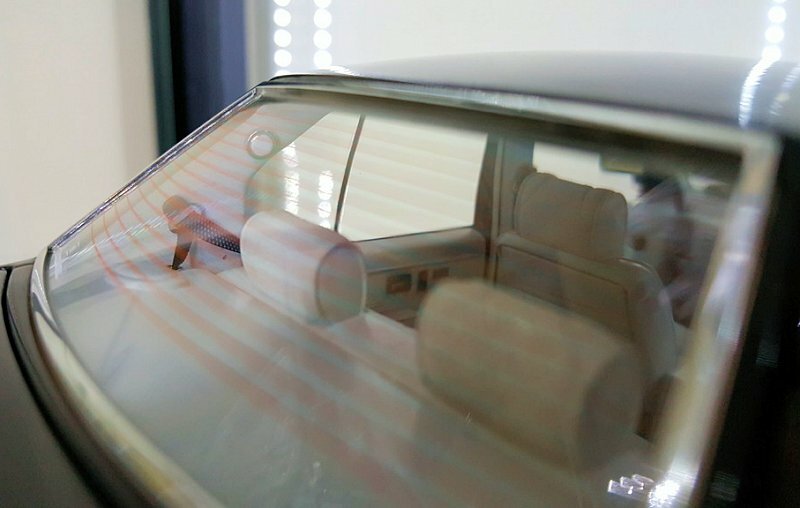 The door window frames are probably a little thin compared to the actual car but are still nicely molded with the chrome plated strip around the window edge. 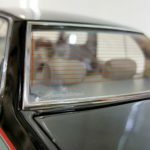 Side view mirrors do sit a little high but they look pretty close to the original car and have reflective sticker to mimic an actual mirror. 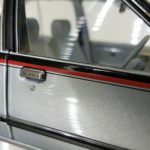 Side body moldings are nicely replicated with the thin chrome and thicker black rubber strip with nicely printed “Commodore SLE” details. Door handles and key barrels are physical parts and nicely molded. Key barrel has vertical slot for key. Opening fuel filler cap is a nice included feature but the fuel cap itself is lacking detail. 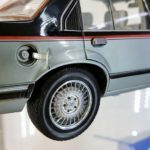 If I remember correctly the fuel filler cap was a chrome plated item but I could be wrong. The front of the car looks great with accurate head light and blinker design. 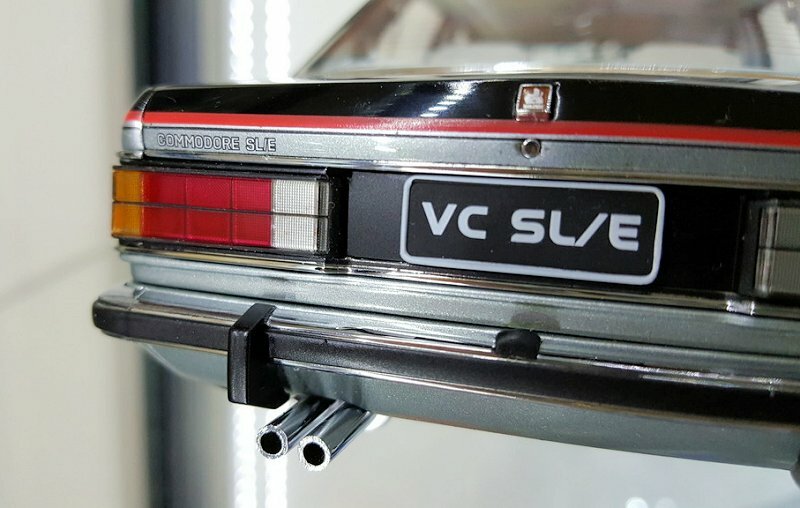 The SLE also has head light washer and wipers, an option which would be deleted for the next VH model. The grille is reproduced very nicely though is not see through. A minor gripe but still looks faithful to the actual car. 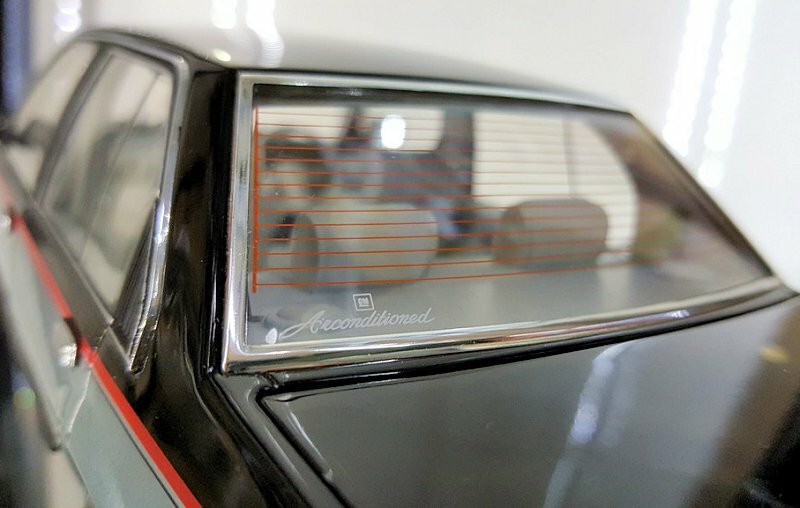 The grille mounted Holden emblem and Commodore badges are very nicely detailed, clear and easy to distinguish. 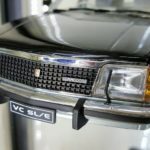 Front chrome plated bumper bar is perfectly molded with black rubber strip and nudge blocks. Sadly there are number plates front and rear which is a personal dislike of mine. Moving to the rear of the car the tail lights have been recreated very well with clear and defined blinker, brake & reverse elements and are all colored perfectly. 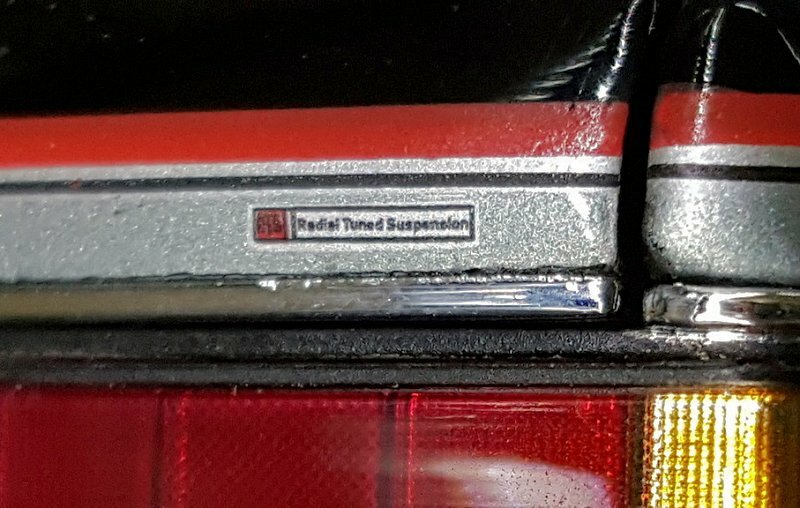 The badges are clear & crisp and zooming in you can even read the “RTS Radial Tuned Suspension” logo on the right hand side of the boot lid! 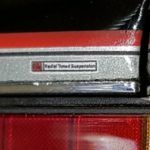 The Holden emblem again is a physical badge with clear printing. The key barrel also has the vertical slot where a key would fit. Rear bumper bar is molded just as well as the front with nudge blocks and has the number plate light in the center. Exhaust pipe tips are a little thick around the edging but are hollowed out for the appropriate effect. 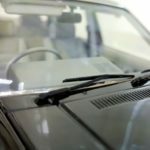 Front and rear windscreens are shaped correctly and the windscreen wipers are simple but adequate. 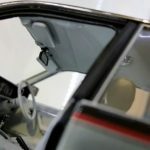 The heavy chrome windscreen & rear glass surround moldings are done accurately as the SLE models had a thicker strip than the lower spec models. 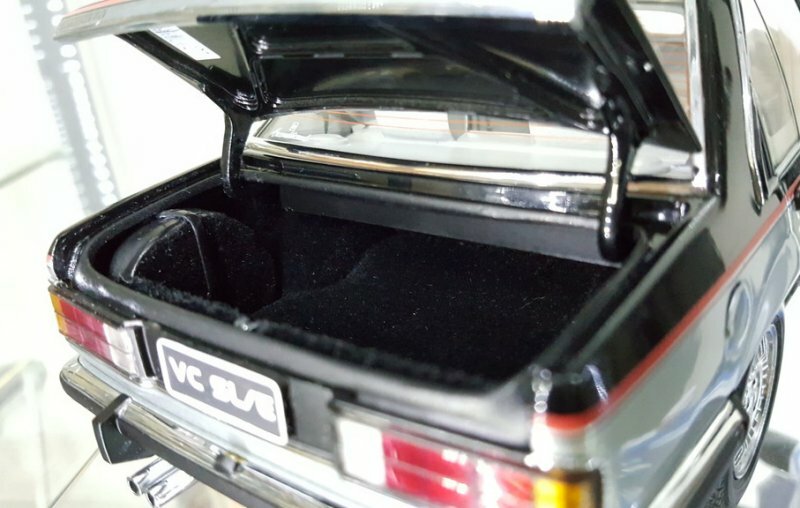 Also the rear glass has a nicely printed “GM Air-conditioned” sticker and the rear window demister lines are a fraction too thick but still printed quite finely and look more than ok. Bonnet vents are also nicely detailed. 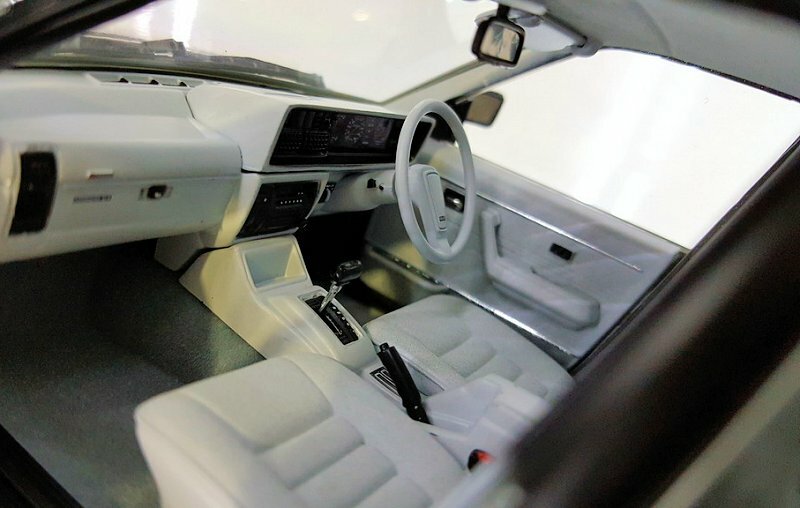 Interior detail is where this model really shines as its very faithful to the actual car! 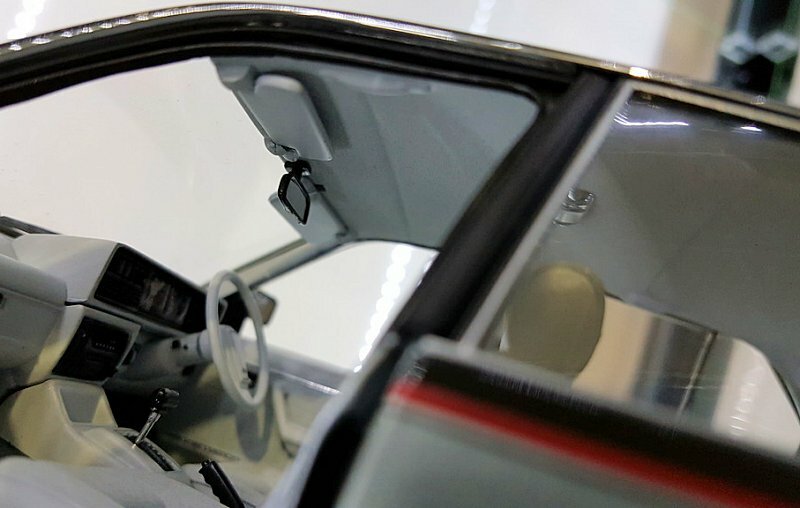 The interior also features movable sun visors, movable gear selector, movable hand brake lever and positional front seat backs. Instrument cluster is nicely detailed and clearly legible. The dashboard center stack is also nicely detailed with premium stereo and air conditioning controls. The center console has accurate storage pockets but the power window buttons are a sticker and not actually molded. I minor negative but they look adequate. 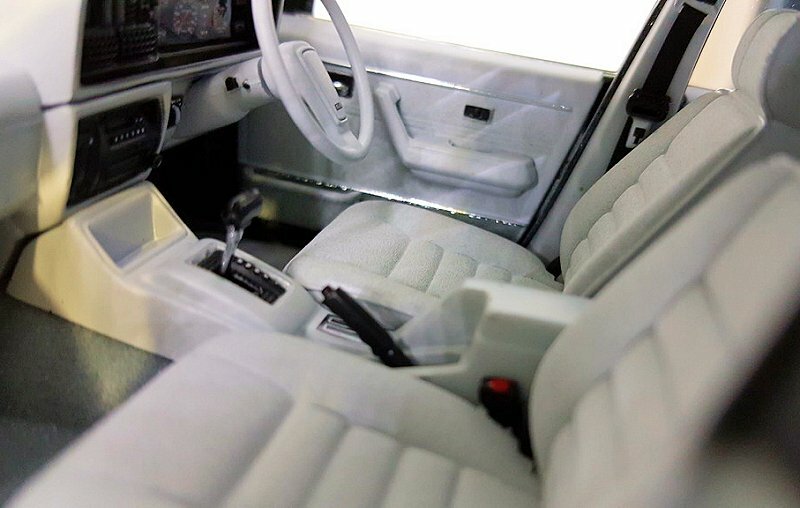 The rear of the cabin has speakers on the parcel shelf, vanity lights on the “C” pillars and material seat belts to match the front. The rear belt buckle latches are molded into the rear seat bench and the black paint to highlight could have been done a little better but they ok. Again better they are there than not at all. 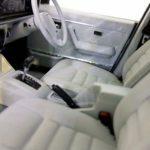 Seats are molded accurately and even though are plastic they have nicely detailed surfaces to give the velour or leather look. Seat belts are made of actual material and have metal buckles. The buckles are a little too big but its better they are there than not and still perfectly fine. 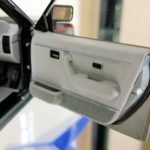 Door cards are accurately detailed with arm rests, door lever, lock lever and door storage pockets. 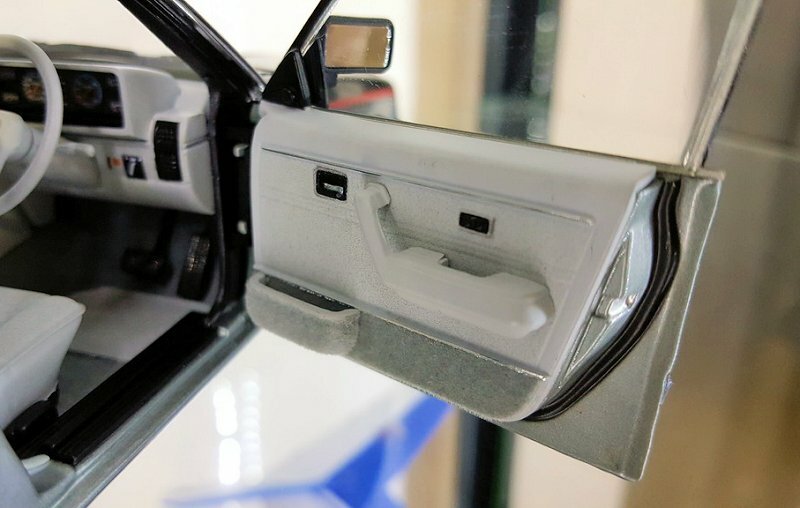 The rear door cards also have power window switches for the rear passengers. The lower part of the door is carpeted as per SLE options. 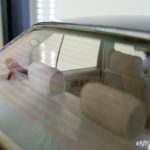 In this photo you can clearly see how the side view mirror sits about 3 to 4 mm too high. 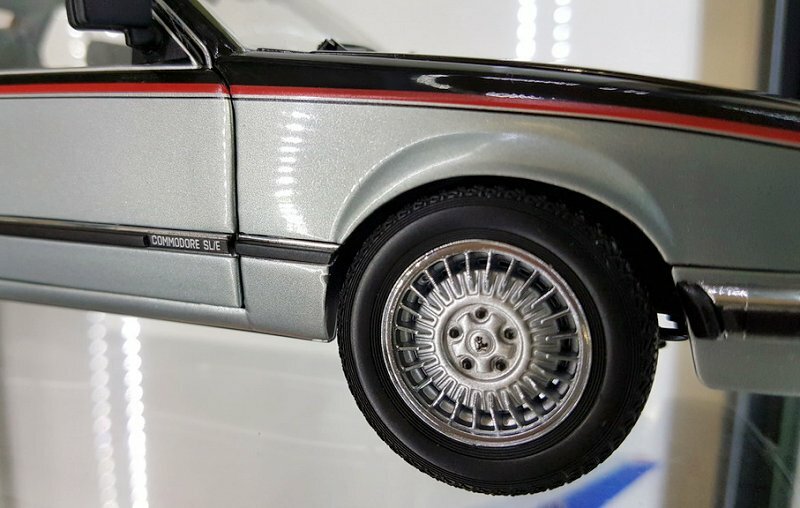 Wheels are nicely done with accurate detailing and proportions. 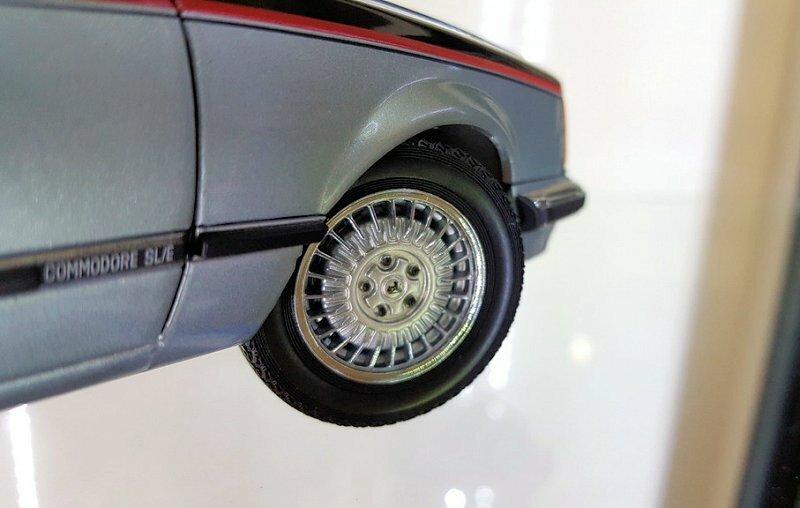 Chrome rim edge with flat silver center section look great and the Holden emblem on the center car is very finely printed. Black wheel nuts finish the look. 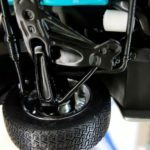 Tires are accurately shaped to the period but do not have any brand or size markings. I don’t know what brand or the exact dimensions from the factory but they appear to fit the car as intended. 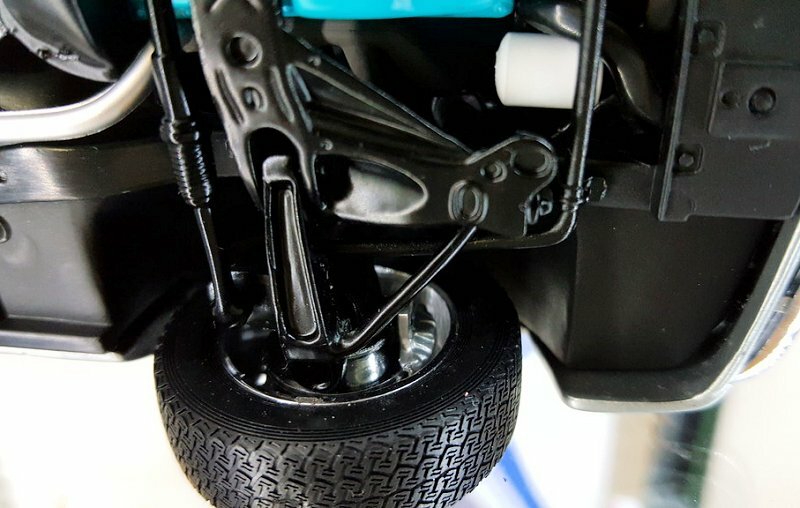 Front wheels steering has a good range of motion (40+ degrees) which is a nice feature! Boot is fully carpeted. Spare wheel cover has been done accurately with carpet for the center and vinyl around the outside. The strap is also present and has the tightening clip! 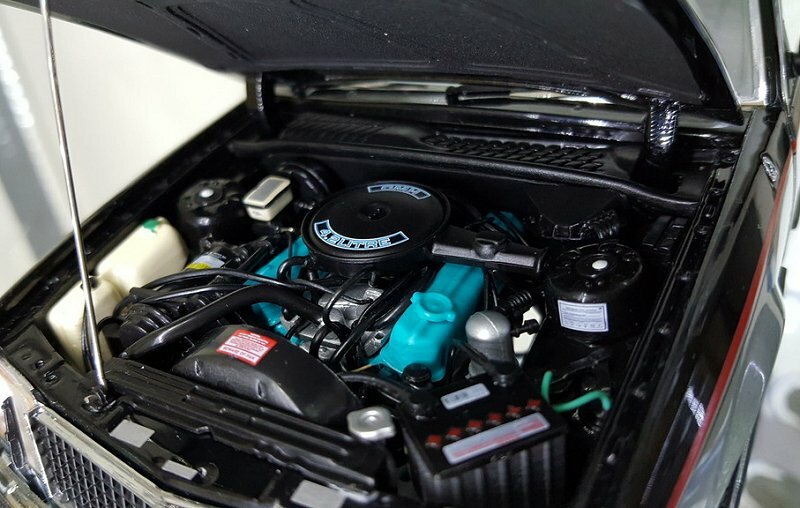 Engine detail is another strong point for this model and included the blue colored engine block and rocker covers to represent the blue motor upgrade for the VC model line up. The VB engines were colored red. But now gone are the days of painted engines! LOL! 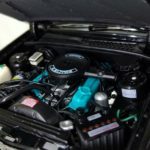 Other engine bay details include the battery, accurately detailed suspension strut towers, radiator & cap, fan shroud, air conditioning pump & belts, engine air intake cleaner pan and nozzle, engine intake & exhaust manifolds, windscreen washer and engine coolant bottles, brake booster & fluid reservoir plus various pipes and hoses all nicely recreated. 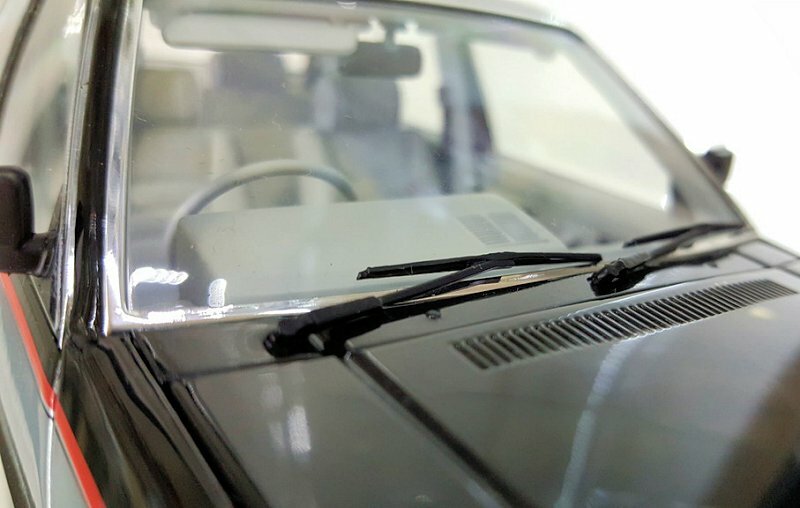 There is also a bonnet support stick. Yes there are a pair of big ugly dogleg bonnet hinges but they are painted black making them not as visible as other models. And the fact the engine bay has so much other detail I’m prepared to excuse this normally deal breaker item. 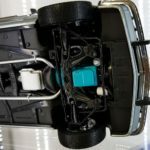 Under body detail is also a high point for this model! 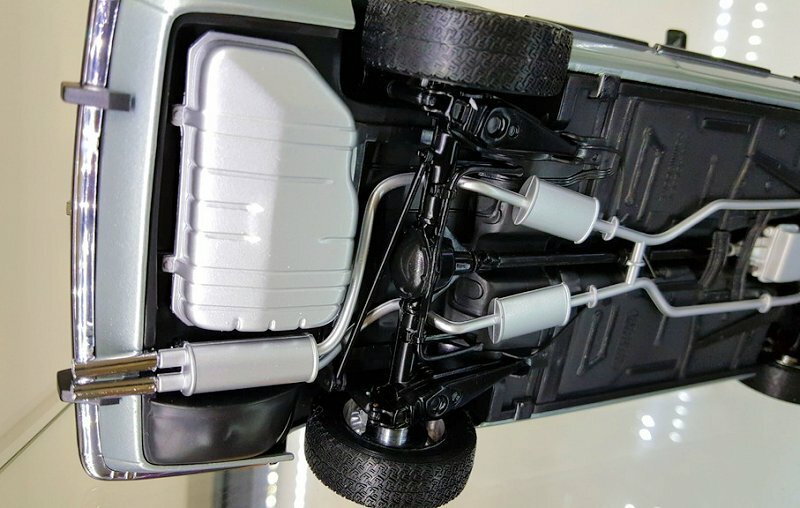 It has very nicely detailed and working suspension all round and both the front and rear suspension components are mostly functional! 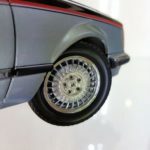 Even the tail shaft rotates when you turn the rear wheels! The front and rear disk rotors spin with the wheels and have pass through brake calipers. The calipers are quite simply made but on these older cars the brake were quite simple and small so this is more than adequate. Engine oil sump has visible sump plug and securing bolts. Engine oil filter is visible as with the gearbox oil sump cover and securing bolts. 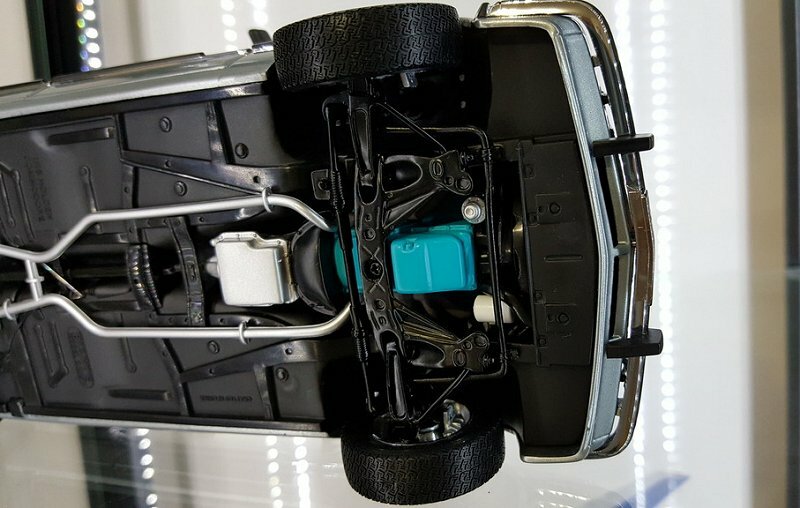 Floor pan detail is also quite accurate with chassis rails and other details visible. 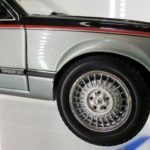 From this photo you can also see the tire tread pattern but I cannot confirm is this is period accurate for this car though considering the effort they have gone to everywhere else I’m sure it is. At the rear you can see the live rear axle, pan hard rod and trailing links all nicely crafted functional! 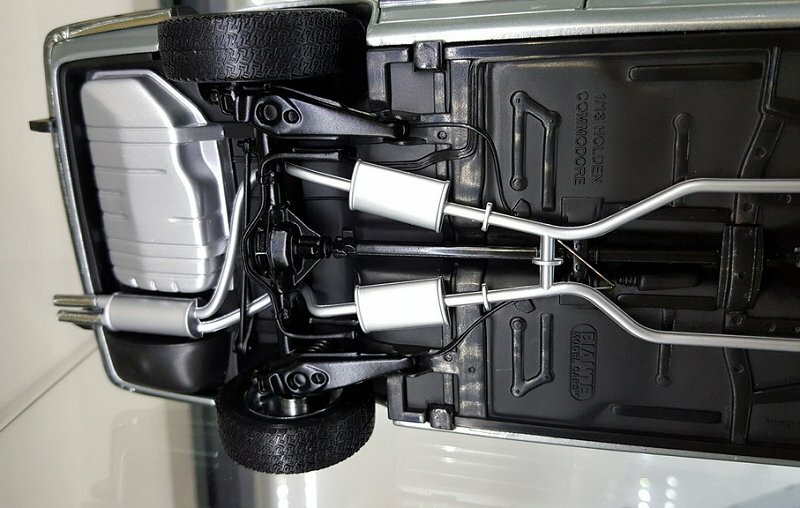 The floor pan has details such as brake & fuel lines, park brake lines, and chassis rails all visible. 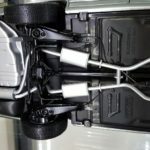 The exhaust system is well made and looks accurate. The fuel tank I think should be black to match the floor pan if I remember correctly but again I could be wrong. 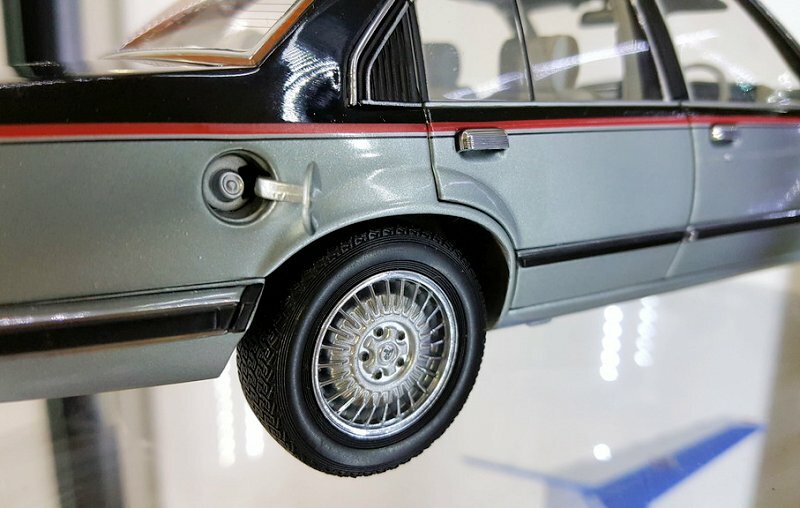 Fuel tank detail is nicely done regardless. I’m pretty sure I have covered just about everything for this model car. Overall I am very impressed by it and it only cost me $100 (AUD) which for all the included detail is a right bargain! 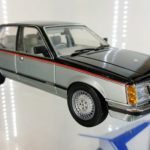 Yyes this is a Biante but I have strong feeling it was built by someone else for Biante as it is clearly superior to other Commodore models made by them. Either way im not complaining nor do I really care who made it as im glad it does actually exist! 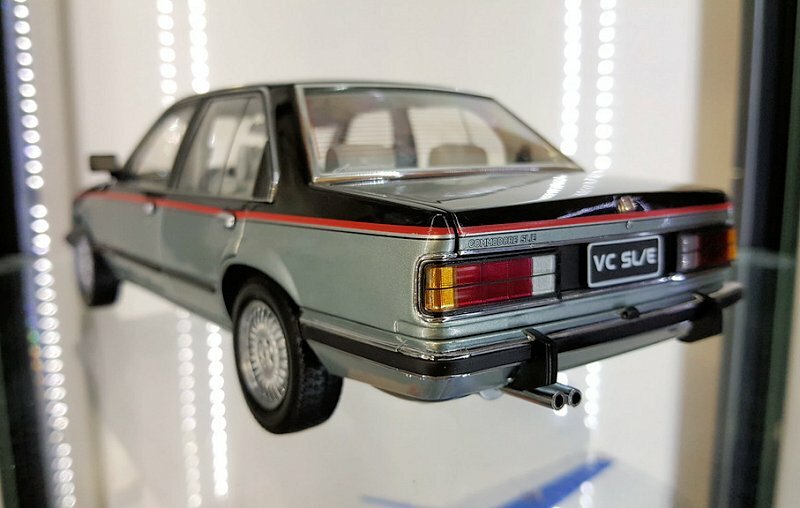 You can also buy the 1978 VB Commodore SLE in the gold color but they demand a bit more money. 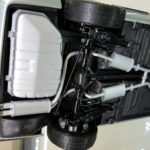 So do I recommend this model? Yes absolutely! Even for non Holden or Commodore collectors. Yes it has a few small accuracy and detail issues but as is mentioned in just about all model reviews, which model doesn’t!? Its certainly a beautifully made piece indeed and one of my favorites of my collection. 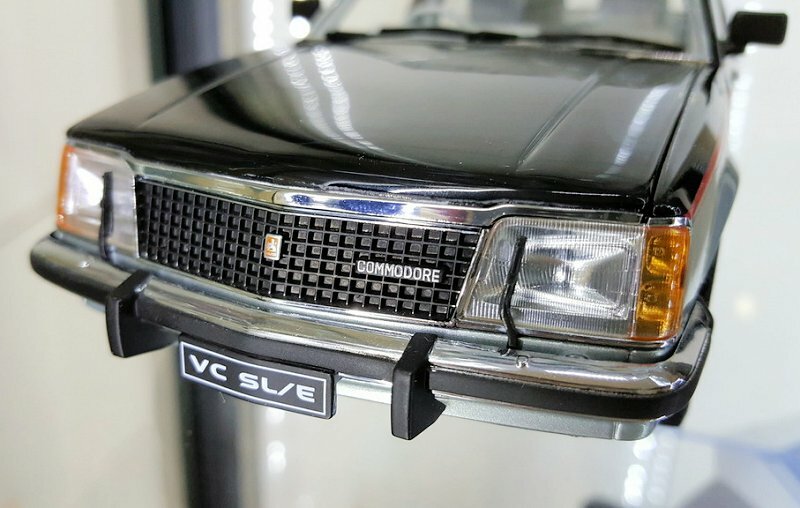 1 Response to "REVIEW: Biante 1980 Holden Commodore SLE"
Beautiful !..gotta get one o’ these !